The history of the New Haven Fire Department dates back to December 29, 1789, when Mayor Roger Sherman, a signer of the Declaration of Independence, formed the volunteer system. 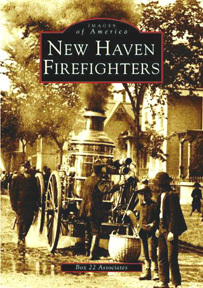 The advent of steam fire engines in 1862 marked the end of the volunteer system and the beginning of the full-time paid department, giving New Haven the distinction of having the first professional fire department in Connecticut. New Haven has a long and proud history of tradition in its fire service. Since 1862 there have been only fifteen different chiefs heading the department. New Haven Firefighters tells the story from the days of steamers to the era of the tower ladder. About the Authors: Box 22 Associates, composed of retired and active firefighters, fire buffs, and business associates, has captured in this book the bravery, heroics, and tragedies of seven generations of New Haven firefighters.